Ask PM is the bit of the site that you get to write - send in your questions regarding the British motorway network, and we'll do our best to answer them. It can be a question about anything, not necessarily about a Pathetic Motorway. A selection of them will be answered here! Was the M41 supposed to go to Birmingham? Was the M3 meant to go to Exeter? Was the M27 due to cross the south coast from Exeter to Brighton (or Bournemouth to Dover, or variants thereof)? What's with the strange bit of A55 near Colwyn Bay? It feels like a motorway, but just isn't. What are those strange half-built junctions you see occasionally for? There was an M41 in London. There was an A41(M) in Hertfordshire. The M40/M42 junction south of Solihull is an odd way around, meaning that M42 traffic has to take an exit in the one direction. All of the above is true, but they are all separate items, with a bit of wishful thinking added in. Firstly, the M41 and A41(M) share the number "41". The theory goes that they must be connected in some way - but as anyone who has read How the Motorways Were Numbered knows, that doesn't matter one jot. Other Mx and Ax(M) pairs exist happily - A3(M) and M3 for example. Combine that with the fact that the A41 goes through Birmingham on its way to Birkenhead, and a theory is born. Secondly, the M40's odd corners are simply the result of a late change to the route to avoid a Site of Special Scientific Interest. And finally, the odd junction layout at the M40/M42 junction is a combination of two factors - the need to avoid the villages in the area, and the missing Strensham - Solihull Motorway. No to this one too! There is absolutely no evidence that either route was ever planned seriously by the Ministry. The only evidence yet found supporting that theory was that in 1936, the Institute of Highways Engineers suggested a network of motorways which included one across the south of the country, though north of the current M27 between the Taunton area, across near Winchester and ending at Dover. Additionally, there was a route suggested that followed roughly the route of the present M3 to junction 8, but ending in the Taunton area. It was almost instantly rejected by the Government. Still, this theory persists - and isn't helped by items such as a 1970s Geography textbooks that asked questions that started "when the M3 is eventually extended to Exeter", and the fact that in the planning stages M3 was referred to as the Exeter Radial, meaning a motorway along the A30 corridor in that general direction rather than literally a road that ended in Exeter. This is a strange section of road - it feels like a Motorway, has motorway restrictions on it (No L drivers, mopeds etc), yet fails to be a motorway. More unusually, it has numbered 70mph speed restriction signs (rather than the NSL white and black signs), even though 70 is the NSL on this route (dual carriageway). Why does it have these rare signs? Does it change the limit for trucks and trailer carrying vehicles? The A55 isn't a motorway as you quite rightly say, but it's as close as you can get to being one. It is a Special Road (the legal term for a motorway), which basically means that it is not a right of way, and no-one can use it apart from people specifically allowed - the opposite case to normal. The reason it has "70" speed limit signs is that there is no defined National Speed Limit for non-motorway Special Roads, so NSL really would mean unrestricted. These non-motorway Special Roads are very rare indeed - there's another example on the A1 east of Edinburgh. However, don't be fooled into thinking that most motorway-esque roads are "secret motorways" - they just aren't, sorry! Do you ever feel like adding "Pathetic junctions"? One side or other of Junction 1 of the M6, for example, it looks as though the road builders were getting into building a junction until someone came along and told them they were in the wrong place. It seems like this is a common feature on motorways (some on the M1, too) but I have often wondered why they are there and what they were intended for. They can't have been lay bys as they are appear to be symmetrical but embryonic exit/entry slips. Any clues as to where to find information about them? I can tell you exactly what they are! Your "junction" is in fact Harborough Magna Services! 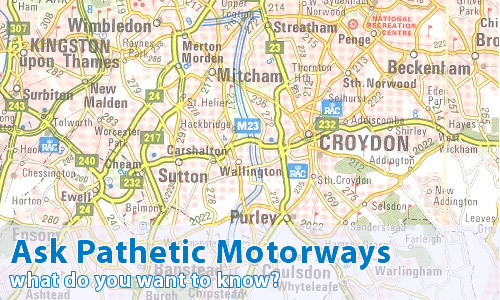 On early motorways, sites were laid out approximately 12 miles apart for Services. Not all were used initially, and some were filled in later. Today those sites are too small for modern MSAs, so they will forever remain unused. As you quite rightly say, others can be found on (amongst others) M1, M4, M5 and M18. Other stubs, however, really are for missing motorways - M12 and M601, for example, both have partially completed junctions. Why are there sometimes painted squares on the carriageway? My query relates to some road markings. I've seen these markings on lots of motorways/dual carraigeways. They don't seem to occur for any reason (that I know of), although maybe they're more common around junctions. The road markings I'm talking about are painted white rectangles. These rectangles are small and are painted in the middle of each traffic lane. The rectangle is more wide than long (although travelling at speed may alter how they appear). The little rectangles in each lane are all level with each other. I've seen them in lots of places but don't know why they're there. Can you help? Those markings that you mention are speed calibration markings for portable VASCAR speed detection equipment. They are a set distance apart so that constables can time the progress of vehicles, and can therefore calculate their speed without needing equipment such as radar or laser. The M7 has been bugging me for years, and I was wondering if you could help me. What geographical region does this represent? The simple answer is: no-where! The longer answer can be found on the How the Motorways Were Numbered feature, but the medium-sized answer is because Scottish motorways (unlike elsewhere in the UK, but like the Republic of Ireland) are named following the number of the road that they replace, so M8 is a replacement for A8, M74 replaces A74, and M73 is kind of vaguely in the same sort of direction as A73. Perhaps. There is no motorway that replaces the A7, which is the touristy route from Edinburgh to Carlisle, so therefore there's no M7.